Hopa Tropa Kukerica! from magda pinkowska on Vimeo. Hopa Tropa Kukerica! clip 01 from magda pinkowska on Vimeo. Hopa Tropa Kukerica! clip 02 from magda pinkowska on Vimeo. Hopa Tropa Kukerica! clip 03 from magda pinkowska on Vimeo. Hopa Tropa Kukerica! clip 04 from magda pinkowska on Vimeo. One of the many reasons I was attracted to Ambassador Theater’s Hopa Tropa: Kukerica was the opportunity to connect and create with international artists. I love to travel and to experience other cultures. Now that I’m in full-fledged rehearsal mode with the Hopa Tropa cast, I’m truly enjoying and appreciating the connection I’m feeling with Bulgaria. 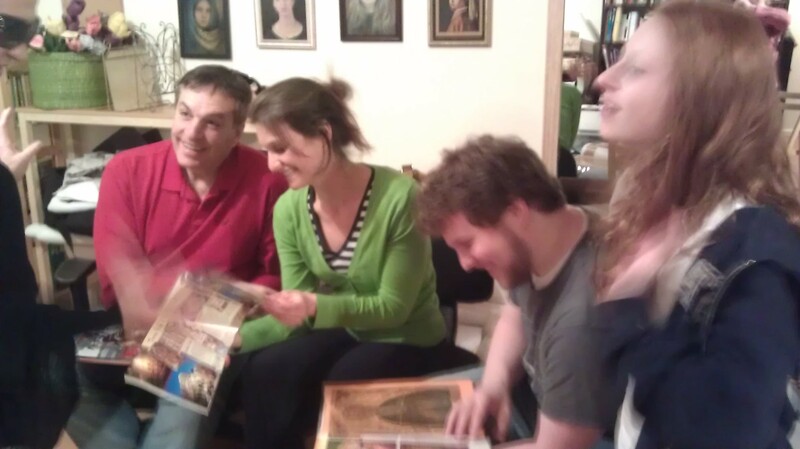 The first time that we had the full cast together, Lilia immersed us in information. We looked at pictures, read books, and listened to music, while the other Bulgarian cast members shared their own perspectives to give us further insight into their country. Now, when I go to rehearsals, I like to imagine I’m in Bulgaria, surrounded by the music, the language and the people. When we rehearse at Lilia’s home, my imagination doesn’t have to work very hard, due to her generous hospitality and the revolving door of Bulgarian guests and friends that are always in her home. From day one, this has been a tremendously satisfying intercultural experience. 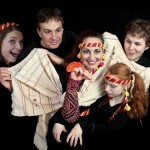 Language Barrier – Rehearsals are in English with the occasional slew of Bulgarian. I’m definitely excited about learning the many Bulgarian song lyrics, and thanks to our musical director, Petko, I have a fairly good idea of what I’m singing about. The other night, I had a delightful encounter of mistaken meanings when the language barrier really came into play. I’ll start by saying that Konstantin’s English is actually very impressive considering he has only been learning the language for about the past year. I’ll also say that he is an incredibly affectionate Bulgarian man with little to no physical boundaries, and I never really know what to expect from him. During this particular instance, he saw me having a little laugh to myself about something and he said, “What you smell?” He started to move toward me and given all of previous experiences with Konstantin, I believed he was on his way over to sniff me. I began to step away and must have had a look of great concern on my face, because he started speaking Bulgarian, maybe to get help clarifying what he was asking, and the Bulgarians began to have a good laugh. It was then translated that he meant to ask, “Why are you smiling?” The room erupted in good natured laughter. Thanks to that misunderstanding, Konstantin says that’s one phrase he’ll never forget how to say in English. At this point in our rehearsal process, I can see the mass of work that lies before us to fine-tune our dances, songs and puppetry. The details that go into each decision for the show are carefully discussed by Lilia and the rest of the production team, and then given to us actors to bring to life. Yes, there is a lot of work to be done, but it is work that I experience great joy in through working with the talented and dedicated team. And although I may feel like I have traveled internationally for a few hours here or there, the truth is, my desire to visit Bulgaria is only stoked more and more as we sing, dance, discover and play. The actors arrive at the top of the hill on a misty, cool Saturday morning. As they stretch and warm up in the parking lot of the George Washington Masonic Memorial, they get the phone call they had been worried about: rain should be falling in an hour and they need to get ready sooner than expected. They pile into a car that’s already half full with costumes and props and drive down to Alexandria’s Waterfront. The newest show for Ambassador Theater, a play titled Hopa Tropa Kukerica is in its final week of rehearsal. 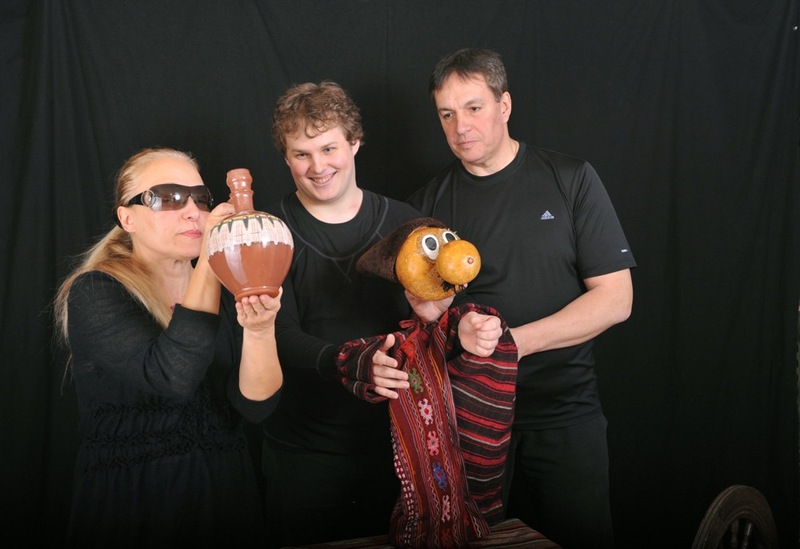 On Sunday, April 1, in renowned director Lilia Slavova’s original and improvisational exhibition of Bulgarian culture, ordinary objects will come to life with the touch of an imaginative family. 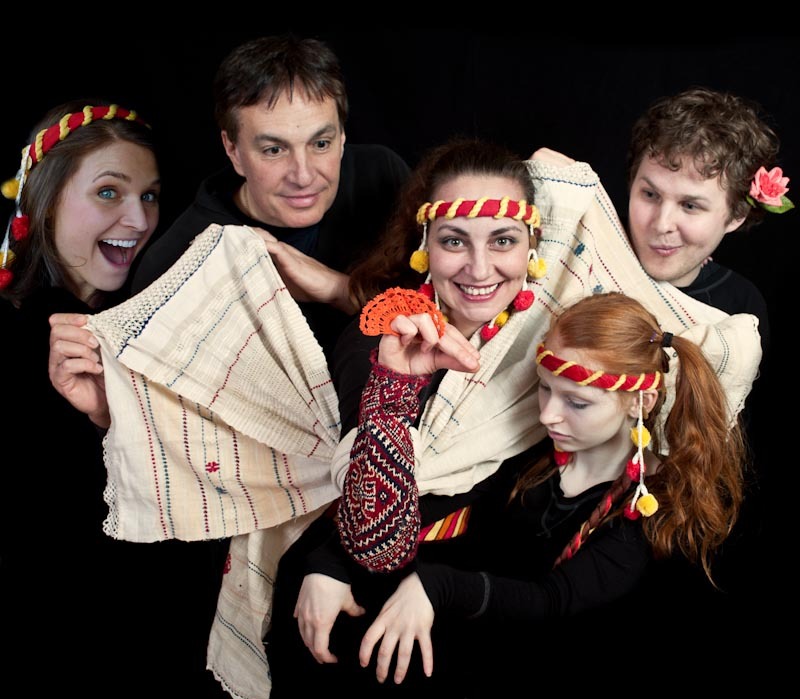 As they dance through the world of the Kukeri (costumed individuals designed to ward off evil spirits) the audience can sing along and join the fun in Bulgarian and English. 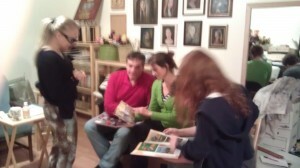 But right now, the Bulgarian and American actors are working hard to promote the play. In front of the joggers and dog walkers they change from their rehearsal blacks to white shirts and dresses adorned with vibrant reds and yellows and jingling head pieces. The young man in the group picks up a loud bell and begins to chant, hopping and clanging behind the women as they pick up their puppets and parade up King Street. An hour after their colorful antics begin catching attention of shoppers in Old Town, the rain sets in and they have to run back to the car. As they drive back to the temple they practice vocabulary and cultural lessons to prepare for rehearsal. However, they are not practicing English. These are the American actors. “Some days the rehearsals are mostly in English, and other days it can be about 50/50. You learn to understand through body language, facial expression, or wait for them to catch themselves and explain what just happened.” Says Amie Cazel, an American in the cast. Hanna Bondarewska knows why she is smiling. The Masonic Memorial Theater is the biggest venue that Ambassador Theater has played to date, and the first in Alexandria, VA. 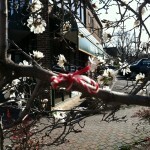 The Alexandria Commission for the Arts gave her a grant to bring this show to Old Town. She is even teaching a workshop about the puppetry and dancing in the show in between the performances. Breaking through language barriers to bring a new show to a new audience in a new theater is both an exciting and intimidating challenge. But the challenge is part of the draw for this cast. Every day they come in and greet their puppets like old friends. For many actors, the prospect of finding an entirely new theatrical experience can sometimes be small, and the largest obstacle they face is the dreaded “been there, done that” mentality that can make hours seem like days in rehearsal. This show is fresh, and the cast knows it. And they aren’t the only ones. What began as an idea to continue with Ambassador Theater’s desire to highlight international cultures and bring them to the DC area, has expanded into a grand celebration featuring the added talents of Orfeia, Svitanya, Zharava and the St. Kliment Okhridski Bulgarian School. Audience members are likely to feel as though they have walked into a Bulgarian village just in time to witness the highlights of a festival. On April 1st, at 11:30 am and 2 pm, this high energy production is just right for bringing out the fun loving fool in everyone. At this point in our rehearsal process, I can see the mass of work that lies before us to fine-tune our dances, songs and puppetry. The details that go into each decision for the show are carefully discussed by Lilia and the rest of the production team, and then given to us actors to bring to life. Yes, there is a lot of work to be done, but it is work that I experience great joy in through working with the talented and dedicated team. And although I may feel like I have traveled internationally for a few hours here or there, the truth is, my desire to visitBulgaria is only stoked more and more as we sing, dance, discover and play. 1st Rehearsal. I’m excited and slightly scared. I am one of the Bulgarians, in a Bulgarian show which will include Bulgarian singing and dancing. That’s a lot of pressure :) . I try to push the worries and woes of the day behind me and go to rehearsal smiling, light and open to people and a world of new possibilities. I am trying to act as a true professional. Push; push away the plans, and the everlasting ticking away of time, that I have become so conscious of lately :). Push away the juggling of time constraints, money limitations, and my desires and ambitions to… well, change the world. 3 hours of dance rehearsal follow. Just try and stand straight (always a struggle after a day of sitting at the office), and smile and laugh onstage. Somehow I lose myself in the steps and the music. I forget the fights which I fight outside of the magical space called rehearsal. During one of the breaks, while catching my breath, I suddenly laugh and I tell my fellow actor, Kosio, I guess we had to come to America to learn Bulgarian folk dances. Somehow, despite the whole ridiculousness of the situation, I am not cynical as usual and I feel happy and light. New horizons have opened again. 4th Rehearsal. I am quite impressed with the director of the show, who’s had a surgery recently but is already with us rehearsing. (She also seems to have more energy than me). Something to learn from. 5-6 Rehearsal. We play with puppets for the first time. I am not sure what my puppet should talk about. He looks confused as well. I try to find his voice. He tries to speak in a low pitched tone, and looks a bit puzzled, as if to say… I don’t think so… I remind myself again to just keep playing. Soon, the puppet starts singing. Another puppet tries to upstage him. But he is happy to be alive again, and keeps singing. 8th Rehearsal. I am driving from NYC and late for rehearsal. I vow for the millionth time in my life that I will never be late again. Ever. Honestly. (Not that I want to really, something always comes up. Like the traffic cop, this one time, ticket and all….. I guess I will have to just duke it out, and leave 1.5h early). I have a confession to make. Back in high school and college, I used to dance every day. I was always in my school’s spring musical, took hip hop and jazz classes, and even went to a weekly swing dance night at my church. One day, some time after graduation, I stopped. I can’t point to a reason or situation that caused me to stop. I just stopped. About 5 minutes into our first day with Ivan, our choreographer, I regretted taking such a long break from dancing. Not just because I was having fun, but because I was already getting sore and my clothes were getting heavier from soaking up so much sweat. 4 hours later, I had lost 4 lbs and found my dancing feet once again. Some interests are worth taking up again, even if they make you sweat through multiple shirts! I get really excited when I wake up in the morning for two reasons: Hopa Tropa Kukerica and Spring Training. The only thing I love more than the performing arts is watching a baseball game, so right now I feel like a kid who gets to have his birthday party the day before Christmas! We have 1 month to go before our show goes up in front of an audience, and it feels like I’m in the 5th inning of a baseball game. We’ve been playing for a while, but we have a ways to go yet. At any moment one of us could pick up a puppet, or start a new song, and hit a home run to put us ahead. Translation for those who are not baseball fans: I really believe that we are one inspired idea away from creating a truly special show. I can feel it as the actors warm up. We aren’t satisfied with being good, or making a good show into a great one. We want to make magic happen. That doesn’t mean we haven’t had our struggles. Some of us have jobs or responsibilities that make it difficult to be at every rehearsal. 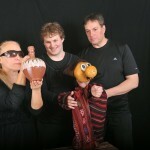 Others have trouble remembering not to touch or adjust the puppet unless they are playing the hands. Everyone has a weakness, and sometimes that’s all we can think about at the end of the day. Sometimes, we forget that we have strengths that can lead us to discoveries that will inspire everyone. It’s time for one of us to step up to the plate and take this game to a new level. Will it be me? I’d like that, but I don’t know. No matter what, I’ll do everything in my power to help the team. When the full cast met for the first time, we could hardly contain our excitement. Not only were we about to create a show that would bring Bulgarian art to a broad audience, we were preparing this show for a beautiful space: The George Washington Masonic Memorial Temple. After one rehearsal, I became nervous. 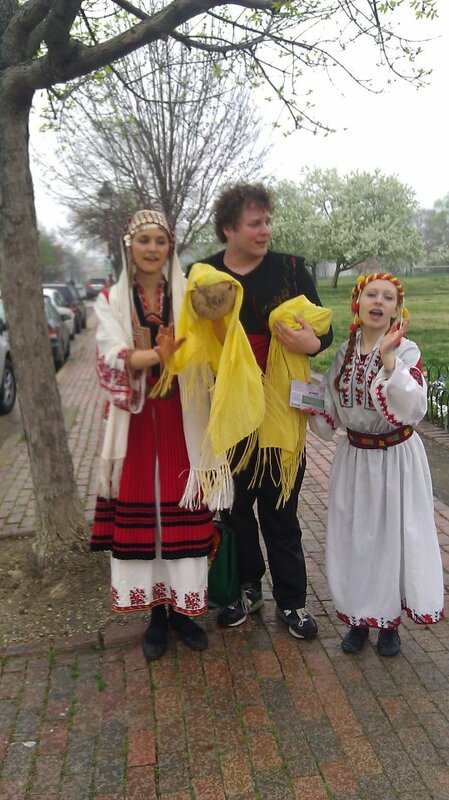 I realized how little I knew about Bulgarian culture. But three rehearsals later, I realized how much more I wanted to learn. The music and culture of Bulgaria is rich with diverse history and influence. A nation that stands as a gateway between east and west, their art is a reflection of the many peoples who have passed through their lands. But with every new chapter to the history of their country, the Bulgarian people have always held fast to their own identity. They continue to dance, sing, and play as only Bulgaria can. I feel very fortunate to be given the opportunity to dance as they do. “Dancing, singing, playing, and puppetry. What more can you ask for in one day?” – what everyone was thinking at the time!